Standard - $999.99 Only 2 left! X-Large - $999.99 Only 2 left! 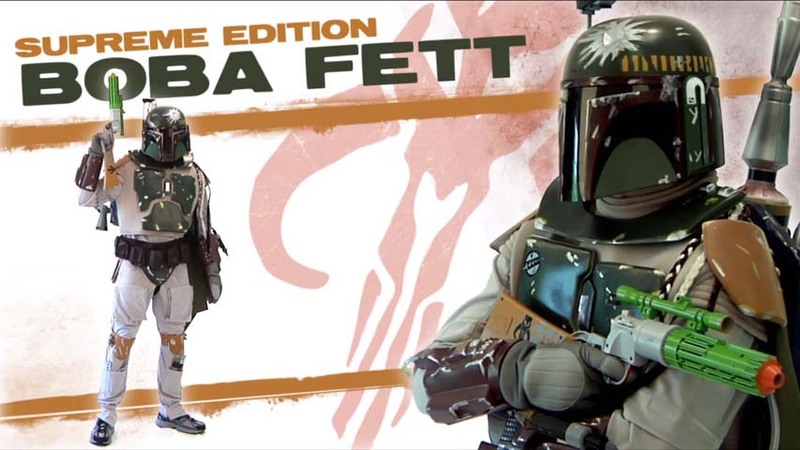 You don't even want to know what we had to go through to get Boba Fett's Mandalorian armor. Since Jabba's untimely death, tracking the guy down is nearly impossible. We checked in the stomach of the Sarlacc on Tatooine and on Bespin. Then, after a few more false leads, we finally found him on Coruscant. Anyways, to make a long story short, a few Pazaak games later and some really unlucky cards for Boba, we came into possession of some top notch bounty hunting gear, which we might just be willing to part with. (We're really not cut out for the bounty hunting business). It comes complete with helmet, armor and a jet pack. We're still keeping Slave I though. I received this and all of the parts that you need are included, the helmet shape is decent and with a good paint job you'd have a pretty good Fett helmet and should be sufficient for a casual Star Wars fan. But there are some glaring problems with the rest of the one I received. When I opened the box the left gauntlet's top laser was detached and appears to have been glued on with Elmers glue. A tube on the right gauntlet was detached that appears to have the same glue. The rocket on the jetpack was intact when I opened it, but broke off when my wife was helping me put it on (again with the same glue). I ended up exchanging it for a new one and told them to open it and make sure everything is intact before it's shipped back to me. The customer support person I talked to was very helpful and agreed to ship me out a new one and emailed me a packing slip to send it back free of charge. I received the replacement costume and everything was intact except one of the tubes on the right gauntlet. At this point I did some research and discovered the forum thedentedhelmet.com which is an amazing resource and found many other people who have purchased this same costume with the similar issues and more. More problems I discovered is there isn't a zipper in the crotch, so to use the restroom you need to pull the jumpsuit down that involves taking off 95% of the costume. The belts are not real leather or wool but are made out of a rubber/plastic mold and don't look screen accurate. After the belts one of the biggest issues IMO is the vest & neck seal. The neck seal isn't even close to being screen accurate. The vest is made out of a super thick polyester material and looks very bulky on a large person like myself. The jet pack shape isn't half bad and is very light for it's size but you may need some epoxy glue to keep parts in place. Overall the paint job on all of the hardware is very, very poor. And after all that there's more issues that I could go over but won't. 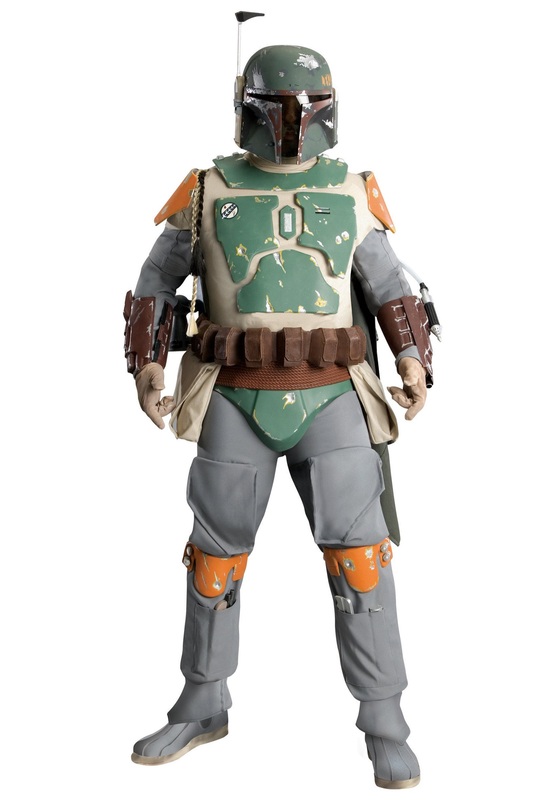 If you're looking for a halloween costume this seems like a great idea to become the most feared bounty hunter in the galaxy, but after you pay $899 or $549 or $429 you quickly realize that the quality just isn't up to par for something as detailed as a Fett costume. And if you're like me I was expecting much more for the price I paid and am now in the process of replacing and or modifying the entire costume. Before purchasing this I implore you to do more research. P.S. - The picture shows boots but they're not included.